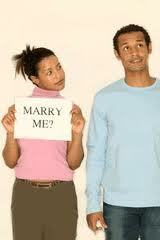 Women proposing : Why it won’t happen? We are traditional when it suits us and only when it suits us. The rest of the time we are card carrying feminists who believe that men should do the asking and us the decision making. Equality is really whatever we want it to be. Men chase, women choose as they say. This is the only double standard afforded to women so I don’t mind using it today. bought is a ring she buys for herself? (Looks in piggy bank and doubts 12 £2 coins will crack it. What gift? I know nothing about engagement gifts for me. It’s just not set up that way. I would consider proposing if society changes and men start wearing engagement rings. I would want everyone to know that he was taken and by a woman who has tastes. Shame men’s rings are so bloody dull. Might I suggest a small engagement tattoo near the earlobe to indicate he’s taken? £30 well spent. Hmmm, I still need £6 more. t wanting to hurt our feelings. So they’ll keep sleeping with us even if they are in love with someone else. So a yes is never a guaranteed 100% yes. Best you ask her. We are cowards. We aren’t as strong as all you big brave men. We are spoilt. This isn’t going to chance on one day in 4 years. You indulge us and we love it.